Pretty circles of lace make beautiful Christmas tree trims. How to make simple circles of lace to decorate your Christmas tree. Lovely in white, as shown here – but you can also use lace in Christmas colors, either plain or with metallic highlights, as another variation. These make wonderful ornaments for your Christmas Tree. Amount of lace required will depend on the fullness desired and the weight of the lace. I used about 15 inches for one and 36 inches for the other. Feed your lace onto a piece of wire as close to the bottom edge of your lace as possible, while keeping the lace secure to the wire. You can either feed the wire through the lace or feed it back and forth, depending on the chosen lace. Pull the lace tight to form a ring, twist the wire ends together to secure and cut any excess wire. Glue a small ribbon or porcelain rose to the centre. You can add dried florals, small ornaments or other objects to the center of these. 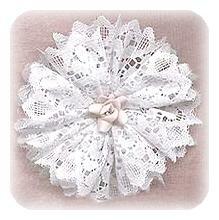 If you like this craft, you may also like to make Lace Snowflakes, which are made in much the same way.